A Powerful and gripping movie about an antihero and his struggles. Flight is a pretty intense film. it’s about a drug addicted pilot who makes a pretty bad decision one morning and spends the rest of the movie regretting it. 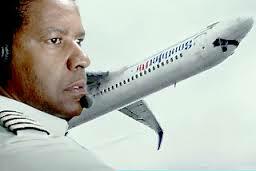 Denzel Washington plays Whip Whitaker, a man who flies a passenger aircraft while under the influence, has the plane fall apart on him, and crash lands it in an open field. Some people die, and Whitaker is put on the hot seat because of his drinking and drug use. The first thirty minutes of this movie are incredibly gripping. The last thirty are also fantastic as the climax takes us to all kinds of unexpected places. in between, the mid-section of the film slows down a little to include a love story about two broken people. That part of the movie could have been shortened, but other wise, this is a very good film. Flight is a pretty great movie. It’s one of those films that reminds you, with all the lousy movies that they make today, and how they are so similar to other movies that we’ve already seen, that there are still fresh and original ideas out there. This one certainly is that. 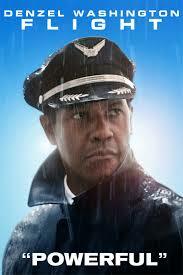 It’s about an alcoholic and drug addicted pilot who goes through a pretty traumatic experience. That’s the character part of the story. This guy has had it rough, with a wife and son who have left him and now don’t even talk to him unless they are trying to hit him up for money. Whip Whitaker (Denzel Washington), gets into a wild situation at the start of the film. They talk about big events kick-starting a movie, but none is as big as this one. He wakes up with one of the flight attendants in his room, finishes his beer from the night before, gets dressed and heads to the airport. Once there, he boards the plane, meets his copilot for the very first time, and speaks to the head flight attendant, who he has known for about ten years now. Once everything seems in order, Whitaker and his copilot take off. That’s when the trouble starts. From very early on in the flight they get into a problem where there is a ton of fog and an area filled with heavy clouds that they have to push through. It gets pretty bad with turbulence at times, and Whitaker has the idea of pushing the plane to as fast a speed as it can go, just to get out of this area and into the sunlight as quickly as possible. His idea might not be safe or correct according to airline guidelines, and his copilot certainly has a problem with it, but it works, and everything is smooth sailing afterwards. At least for a while. The flight continues to go on, and Whitaker takes a moment to go out and address the people on board, taking the microphone and making some announcements. While he’s doing this, he is also pouring liquor into a glass, in a place where nobody can see it, and making himself a drink. Since drinks have been outlawed on this flight, this is really the only way he can get a drink, and that’s the reason why he’s making announcements to the people out there, in the plane corridor, instead of from the cockpit, using it as a way to get to the booze. It isn’t long before the real problem of the flight begins. The plane starts falling apart, and soon engines start catching on fire. They are both put out immediately, but in order to lighten the plane and smooth out the flight, they have to dump all of their fuel. Whitaker figures out where the nearest airport is, but it is too far away, and they don’t have enough fuel left to make it there. That’s when Whitaker realizes he can make it to an open field, but only if he rolls the plane upside down, to help buy him a little more time. The whole plane sequence is amazing. It takes up about the first quarter of the movie or so, and it is extremely powerful and intense. When the plane gets turned upside down, we go into the passenger area and watch as people who aren’t strapped in, fall out of their seats and land on the ceiling of the plane. A flight attendant entraps her seat belt to crawl along the ceiling and try to help out anyone who needs assistance, including a small boy who has fallen out of his seat. At the end of the plane scene, the plane has crash-landed into the field, and six people have been killed. Four of those people were passengers and two of them were members of the flight crew. Whitaker is bed-ridden in a hospital for a number of days, trying to make sense of his world and what his next move should be. Everything seems okay for him until he gets a call from his union representative, (Bruce Greenwood), asking him to meet for lunch with a lawyer who they flew in from Chicago. This lawyer is played by Don Cheadle, and he lays out for Whitaker exactly what the new problem is that they are now facing. While Whitaker was in the hospital, the authorities tested him and the other crewmembers for intoxication and found that he was way over the legal limit. This means he can be arrested for manslaughter and can very easily be facing lots of prison time. Whitaker gets to work with Hugh Lang (Cheadle), to figure out the best approach and try to win the case. Lang gets the toxicology report thrown out because of the way it was taken, but he still has to find a way to get his client in the right frame of mind, in order to have a chance. Aside from everything else going on in the movie, flight has another subplot happening about a drug-addicted woman whom Whitaker starts an affair with. We spend a few scenes with this woman early on, watching her deal with a drug dealer, and then her scummy landlord. All the while, we wonder what she has to do with anything and how she connects to the Whitaker story. It turns out, she is simply a character who he will be meeting later on, and he ends up taking her in, and starting a romance with her. This storyline is the weakest one in the film, and often feels out of place. It’s not bad, and it does have purpose, which is to help space out all of the plane hearing events, but it could have been a tighter and more interesting story. The movie as a whole is pretty great. That’s in large part due to a fantastic climax. There’s a great scene of Whitaker the night before his hearing, and then the hearing itself, which is handled in a very smart way. Nothing is as you would expect it to be, and nothing is simple. That’s a good thing, as psychology ends up being a major factor in Whitaker making some important decisions toward the end of the film. The first thirty minutes or so, on the plane, were fantastic, and the final portions of the film are also great. In between, everything that we were given was fine, but it wasn’t quite on the same level of intensity. Even still, flight is a really clever, interesting, and compelling movie, and Denzel Washington gives a hell of an unglamorous, yet talented performance in the title role.